Weekly Market Analysis: March 14th to 18th 2016 - Find the best Binary Options Brokers, Binary Options Bonuses, Binary Options Signals, Binary Options Software and everything Binary Options related on Binary Options Directory! 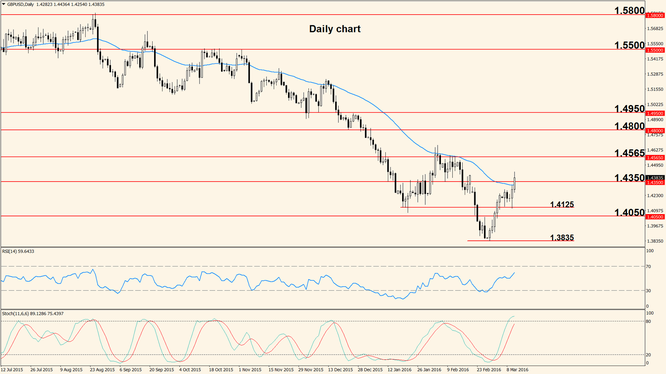 Weekly Analysis: Last week was “governed” by European Central Bank’s surprising decision to cut the interest rate to 0.00% and the deposit rate to -0.40%. A price storm soon followed, with wild swings and sharp reversals, creating an ambiguous environment. Usually a rate cut weakens the currency and initially the Euro did what it was “supposed” to do but soon after it decided to strengthen and move into 1.1210 resistance. This massive swing is likely to influence this week’s price action and now the downside seems difficult although one can argue that a weak Euro was the ECB’s goal when they decided to cut. If the resistance at 1.1210 is broken early in the week we can expect a move into 1.1375 and even 1.1450 but a down move shouldn’t be overlooked as it still remains a viable option. If this is the case, the 50 period Exponential Moving Average can offer a reliable first target. The week starts slow Monday, without any important announcements but Tuesday action picks up with an important U.S. indicator: the Retail Sales. The indicator measures changes in the total volume of sales made through retail outlets and usually has a strong impact on the US Dollar, with higher values strengthening it. Wednesday will probably be the most important day of the week for the greenback as the U.S. Consumer Price Index (a key measure of inflation) comes out and later in the day the Fed will announce their latest rate decision. No change is expected but a press conference will be held by Fed Chair Janet Yellen and a formal statement will be released. All this is likely to generate strong and possibly irregular movement. Thursday the focus shifts on the Euro for the release of the European Final Consumer Price Index. This version of the CPI is the least important because German inflation data is already released and so is the European CPI Flash Estimate. Friday’s only notable indicator is the U.S. Consumer Sentiment survey released by the University of Michigan. It tries to gauge the opinions of consumers about current economic environment and is often indicative of near future retail sales levels because a confident consumer often spends more. 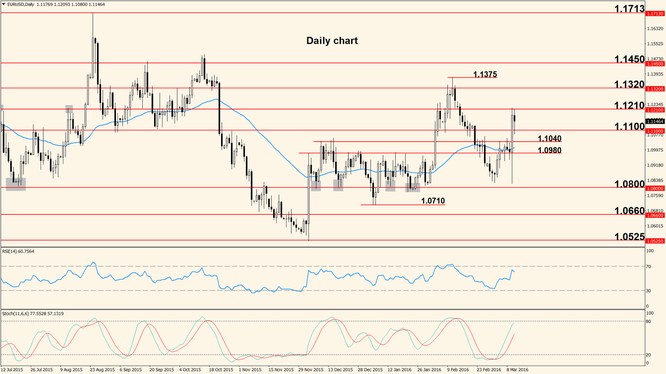 The Pound wasn’t affected by major economic indicators last week but the ECB decision extended its effects on the pair, generating a bullish week and a move above resistance. The pair remained above 1.4125 after bouncing twice off of it and even moved above the 50 period Exponential Moving Average and 1.4350. This makes the short term bias bullish and opens the door for a touch of 1.4565 zone but we have to note that the pair is still in a downtrend (price is making lower lows and lower highs) and the Stochastic has reached overbought so we cannot rule out a move south. If such a move occurs, the 50 period EMA is the first potential support and a place where the pair could bounce higher. Two major economic releases will affect the Pound this week: the first is the Claimant Count Change released Wednesday, which shows the change in the total number of people who asked for unemployment related benefits. The second event is the Bank of England rate announcement, scheduled Thursday and accompanied by a statement which will outline the reasons behind the rate decision. Other than that, the Pound has a slow week but the pair will be directly affected by the U.S. events mentioned above.